Join us on Sunday, March 3rd for some food, fun, and a great time as we celebrate Canvas Church's grand opening in our new campus. Our service times will be 9am and 11am. We are so excited and we can't wait to celebrate with you. Don't forget to invite your friends and family! Hey Canvas Youth! Grab a friend and join us this Saturday for a fun youth hangout with basketball, ping pong, and foosball in the Canvas Gym. Can't wait to see you there! Takeover is our event that's all about having fun. Each event is different, they range from bonfires to scavenger hunts to movie nights to trampoline parks. 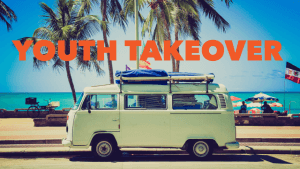 Stay up to date on all the Takeover details by following us on Instagram: canvasyouthsd or email youth@canvassd.com This month we will be hanging out at Nickel City! Invite your friends and get ready to have some fun. Team Night is a night for all of our Ministry Team to connect and recharge. We are always looking for ways to keep the church feeling personal and connected as we continue to grow. This is a fantastic way for all the team to connect with one another while spending time worshiping God and receiving, without thinking about giving out. If you are currently serving on the Ministry Team then this night is for you! Join us on Good Friday for a night of fellowship, worship, and communion.